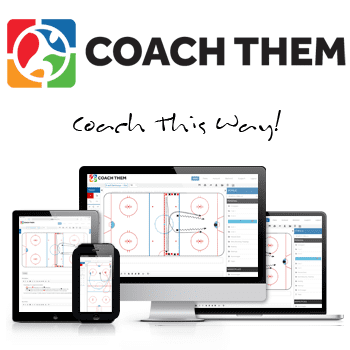 Let me first off thank everyone for such positive feedback from last year working with the Coaches Site. 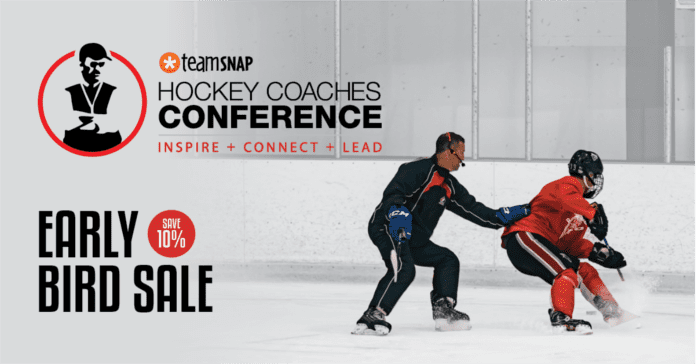 Having the opportunity to speak at the Team Snap Coaches Conference was certainly an informative and enjoyable experience. 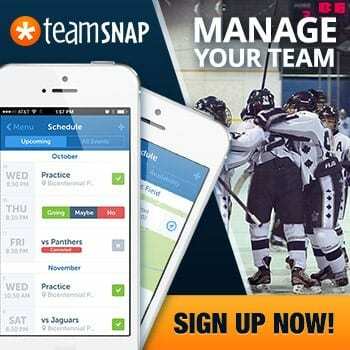 I look forward to continuing with the site and offering my thoughts on various topics relating to hockey IQ. I was asked earlier in the week if I would summarize the record breaking 2nd period by the Tampa Bay Lightning where they recorded 33 shots on net. As I offer my insight on this, please keep in mind that I am making my observations from a distance and not as part of either of the coaching staffs. 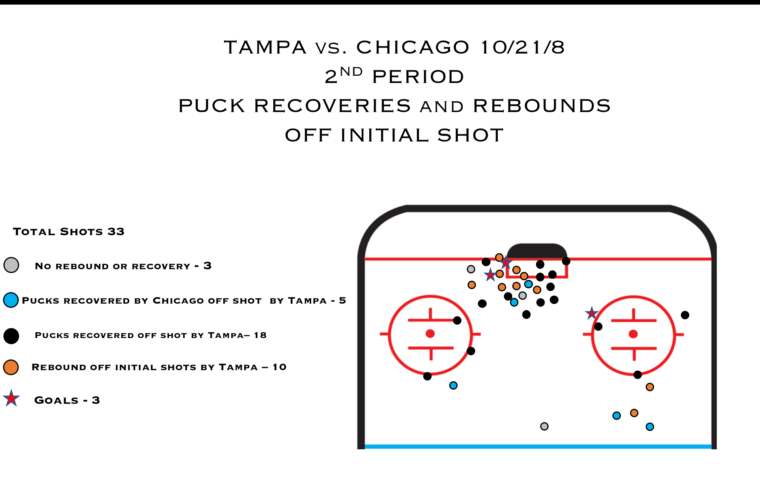 As you can see from the diagrams, Tampa’s ability to recover pucks and collect rebounds was astounding in this game. 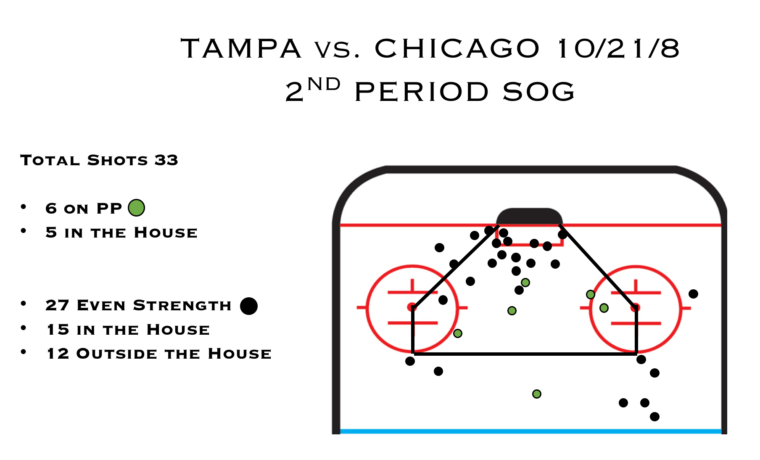 Tampa recovered a total of 18 pucks off rebounds and 10 times got second chance shots. On the other hand, Chicago came up with 5 puck recoveries and 3 dead plays off of a save by goalie Cam Ward. Let me first say that Tampa is a great example of the new NHL where speed rules and the D are active in all 3 zones. Combine their speed, talent and work ethic and you get what we witnessed last week. In the Offensive Zone, they use their speed to retrieve and pressure pucks. 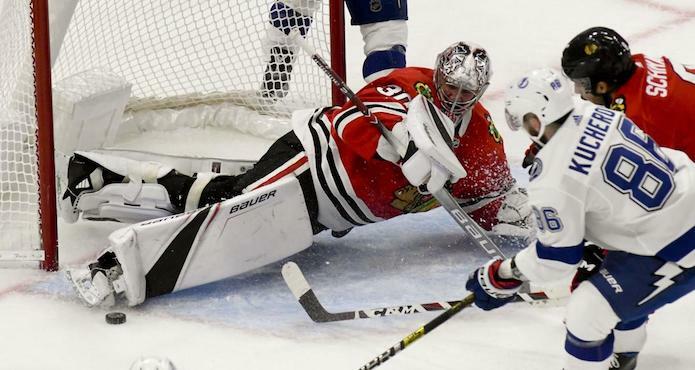 Upon recovery or turnover, the Lightning quickly get pucks and bodies to the net. Part of what makes the lightning challenging to defend is how active the D are. 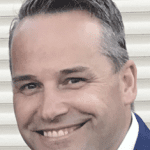 Whether it’s jumping into the open areas or stepping down on the wall, the Lightning D are coming up with second chance opportunities and puck recoveries. Often they end up in a 1-3-1 type in zone offense 5 on 5 which makes it very difficult for opposition to defend. Now Chicago’s poor performance also contributed to this perfect storm. There were several moments where Chicago’s poor play seemed to pour fuel on the fire and cause things to snowball. Additional time spent defending came from Chicago’s inability to manage the game and come up with the “next play”. As coaches, we know all too well what needs to be done to get out of the tailspin, but unfortunately our players’ failure to execute only digs a deeper hole. The following three instances for me were the keys to the demise of the Blackhawks. Immediately after Tampa’s 2nd goal, the Blackhawks D get caught sleeping and give up a breakaway only to take an undisciplined penalty seconds later. 2. On zone entry, the Blackhawks turn over the puck and end up spending the next 46 seconds defending giving up 6 shots and the eventual 4th goal. 3. Although they only give up one shot in this sequence, the Blackhawks fail 4 times to get a clean zone exit. This results in the Lightning getting 46 seconds of pressure and zone time along with a full line change in the 2nd period. We all know how little things can make the biggest difference. It is never one particular thing that results in a 33 shot period. But on this night, the Lightning did many good things to make this happen along with some not so good play by the Blackhawks.